Have you found an online vendor selling El Dorado Special Reserve 15-Year? El Dorado Special Reserve 15-Year rum is crafted from 15 to 25 year old rums that are then blended and married together in bourbon oak casks. Prior to blending the original batches are distilled using 4 unique stills - the Enmore and Diamond Coffey stills, the Port Mourant double wooden pot still, and the Versailles single wooden pot still. 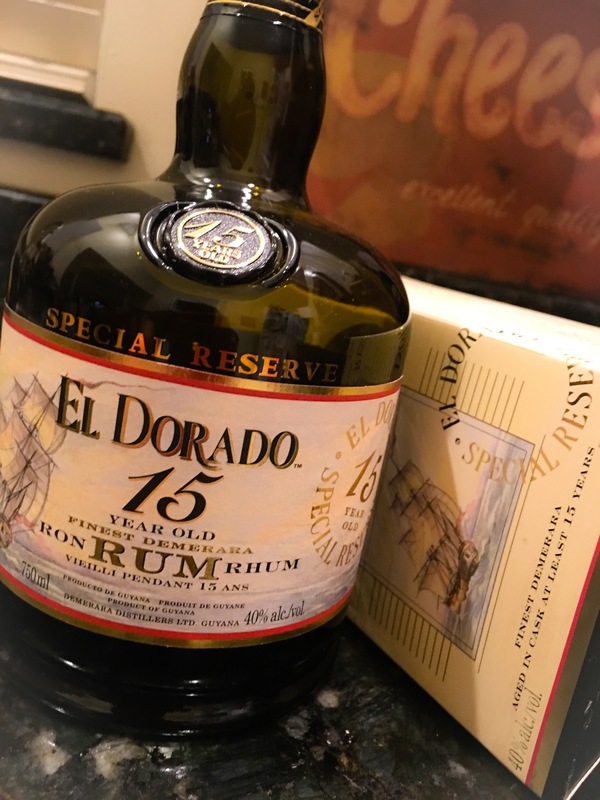 The bottle of El Dorado Special Reserve 15-year was inspired by the the old hand-blown flasks used by sugar planters on the banks of the Demerara river. This is quite a tasty rum. You get all the complexity of the 12, and then some. Like the 12, still very sweet (far too much), along with more charred wood and menthol on the finish (which is fun). The finish is very long and warming. I imagine this would pair nicely with the right cigar. I usually don't use my "sipping rums" in mixed drinks, but I made a little Daiquiri with this recently, and was blown away by how tasty it was. As when sipped neat, the drink was deep, round, and complex. The lime, sugar, and water brought out more flavors than I had detected before. The sweetness in the rum provided a good balance to the lime, and the citrus profile became more orangey. I think I'll be making more of these in the future! A point on the added sugar: Having tasted a couple of ED's Single Barrel releases, I can't for the life of me understand why they add so much sugar. The aged distillate is sweet enough! I await the day when ED releases aged but unsugared blends from their famous stills without charging an arm and a leg (bonus points for offering them at closer to 90 proof). I'd be all over a dryer Guyanese rum with some PM kick and regular distribution :). The market is there, y'all. 8-, 7+. Without sugar, or $10 cheaper, solid 8. This is what I serve first to friends who haven't experienced 'good rum.' It sets a high bar and rarely fails to please. Many will find it slightly on the sweet side, but not as much as, say Diplomatico. The flavor is highly complex and alluring. From a value point of view, at about $40 USD/bottle, I don't think you can do better. Focusing on the El Dorado line, the slightly less expensive 12 year bottle isn't as good as the even-less expensive 8year, so it's skippable. The more expensive 21-year bottle is noticeably smoother but questionably more enjoyable to drink. My cabinet always includes a bottle of ED8 for 'everyday' rum, 15 for entertaining, and EHP for special occasions. Was looking forward to tasting this for some time and was not disappointed. El Dorado 15 starts with a sweet and fruity taste that is followed by a karate chop of funky oak and cognac flavor. I'm not a huge fan of cognac but the change in flavor direction makes me like ED15. A small piece of ice or splash of water makes this rum very enjoyable. Being that I prefer drinking my rum neat, the fact that I have to add water to improve the flavor drops the rating to an 8. At $40 USD (01/2016) per bottle, I will put ED15 on the repeat list. Ok, this is very good rum, I just prefer the 12-year, which, I am given to believe, is not just a younger version of this, but a different rum. The 15-year offers hints of raisins and dark fruit flavors that (I think) indicate a sherry cask somewhere in its history. Many folks prefer this and good for them, but I find the underlying wine-y flavors less preferable than the more oak-y 12-year version. El Dorado 15 comes in a classical bottle and the rum is delivered in a simple paper carton (picture). When you smell the El Dorado 15 you find a very sweet and mild aroma. No sticky alcohol, just sweet aromas of orange, plums and a touch of vanilla. You also get a little bit of smoke and barrel. I the mouth the El Dorado 15 is surprisingly spicy with sweet fruit and a little hint of vanilla. You also get a little bit of smoke and barrel, but just a little bit. This rum is very well balanced. El Dorado 15 has quite high alcoholic content (43%) but you don´t sense that at all. This rum has to rest a few minutes before you drink it. A lot of flavors shows up after 15 minutes or so. A nice formula is to always let the rum rest for as many year old it is. 15 years old rum have to rest for 15 minutes in the glass. The aftertaste is long, peppery (in a good way) and sweet. This rum is a very nice and highly recommended sipper. i like this as both a mixer and a sipper. Versatility makes it a must stock for me. Opened the bottle today and I am very impressed. Just the nose is already great. No alcoholic smell at all. When tasting, it starts with the sweetness of rum without the feeling that sugars have been added. This followed by a hint of oak and cognac - finished by the good warm feeling delivered by the alcohol. Love it! Got this as a Christmas present and was not disappointed! Delicious rum straight up, looking forward to trying it in an old fashioned. ...at least in my opinion. I gave the 12 year a 9 out of 10 only because I had not tried the 15 year special reserve yet and man I was right. This one gets the full 10 out of 10 in my book. This rum is more mellow than the 12 year. A little less sweet however the flavors in this rum is more pronounced. You can really taste the hints of vanilla, almonds, oaky and fruits. This rum will coat your tongue like silk and does not give you any burn. Simply amazing to drink neat, on the rocks, simple coke an rum or other mixed drinks. However I will say. This is a really fine rum. I would rather use the El Dorado 8 year or maybe 12 year for mixing. Leave this one for special settings and drinking neat or on the rocks. 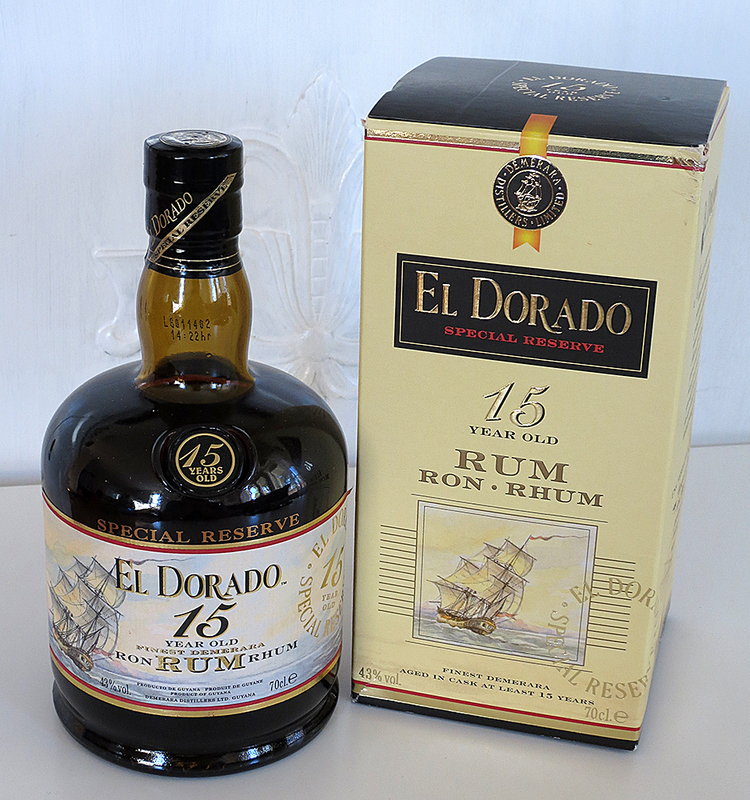 El Dorado 15 Year is een wereldwijd geliefde rum die bekend staat om zijn volle en rijke palet die barst van de tropische smaken en kruidige tonen, zowel op de neus als op het palet. Beschreven als een aantrekkelijke, rijke koper tint. Een complexe neus van banketbakker suiker, bananen en cederhout. Een zijdezachte binnenkomst leidt tot een matig full-bodied gehemelte van levendige, maar toch verfijnd droge caramel en gedroogde tropische fruitsmaken geschoord door warme alcohol en eiken kruiden. Dit premium product is een mix van speciaal geselecteerde oude rum. Sommigen zijn zelfs 25 jaar oud en zijn gerijpt in eiken vaten. Shrnutí: Tak na patnáctiletou verzi jsem se po ochutnání 12y velmi těšil, a zanechala ve mně velmi dobrý dojem, moc dobrý rum, který svou barvitostí ani chvilku nenudí. Moc jsem si pochutnal. Nicht ganz der Weltbeste, aber nah dran. Herrlich samtig weicher Körper, nicht so süss wie der 12 Y.
zu jeder Zeit an jedem Ort. Jede weitere Beschreibung überflüssig, trinken ! Not quite the world's best, but close. Wonderful velvety soft body, not as sweet as the 12 Y.
at any time in any place. Any further description unnecessary, drink it ! This is a way over priced rum, whiskey, rum, whiskey...let's just call it a rum that wants to be a whiskey but also has sugar added to try to make it taste more like rum than whiskey. This is a busy little spirit with a variety of heavy fruit flavors which leads me to my next point: It goes well with a frozen drink or with Coke but its not a sipper. And, $50 a bottle for a mixer is just pain silly! Yes, I'm biased in my review. I just don't think El Dorado makes a real premium rum and the added sugar to an agricole is shameful. Still, this is a good mixer that would be more appropriately priced in the low $30 range (NY prices). Voici un rhum d'une très grande qualité, qui m'a vraiment enthousiasmé! Le nez promet des arômes que la bouche confirme: une délicieuse douceur vanillée, des notes de noix, de dates et de fruits secs. La longueur en bouche est très bonne, laissant au palais tout le temps d'apprécier la complexité des arômes délivrés. C'est vraiment l'exemple-type de rhum vieux parfaitement équilibré et balancé! Une réussite totale! dans la lignée du 12 mais plus sur l alcool. (évidemment ) les mêmes arômes . Un grand plaisir à goûter .toujours cette sensation de douceur, d épices . Facile à boire . I am relatively new to higher quality rums but this one blew all my other forays out of the water. I would attempt to describe it but my palate is still somewhat lacking. I've just received a mini bottle of this rum from RumRatings, so that I had the chance of tasting it: I liked it indeed :) ! The colour is a copper red gold. The aroma has notes of caramel and banana. There are some notes of wood also but fairly discreet. Oak flavors are predominant on the palate but the rum remain sweet and very pleasant. Edit April 25, 2014: Now that I've been able to compare this rum with its older brother 21 yo, I can say that this rum is my favorite one. Note raised to 10. Don’t taint this liquid elixir with anything other than ice. Nice clean finish. Brings to mind sweet molasses. Light burn. Had this as part if a flight including Appleton 12 year and Pyrat XO reserve 15 and found this to be the sweetest of the three, least influenced by oak. The description provided said "Dark coffee,candied orange,dark chocolate and vanilla"...all of which did a nice job of explaining what I was trying to distinguish when I smelled the drink. This was Bevens favorite of the three.